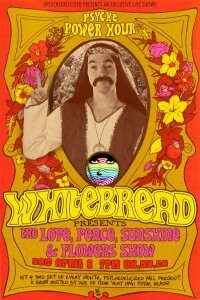 This Saturday Whitebread presents Love, Peace, Sunshine & Flowers! 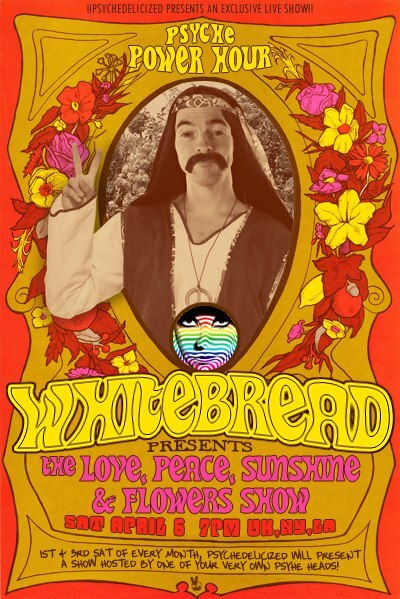 If you’re a fan of those happy-hippie tunes with soaring melodies, please join us this Saturday, April 6, for my very first show: The Love, Peace, Sunshine & Flowers Show. Guaranteed to be a good time and add a little pep to your step! 7pm UK, NY, & LA. Love, Peace, Sunshine & Flowers! Join us on the first and third Saturday of each month for a groovy new Psyche Power Hour!